Hey all! Good Morning, and happy Monday! Today I wanted to do a quick post on my newest makeup obsessions. For my birthday my good friend got me this makeup palette called Naked 2 by Urban Decay. I have used it every day since I got it! 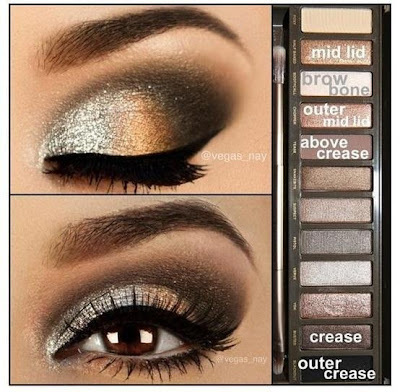 It has the perfect amount of different neutral colors for every day use as well as the right combo of colors for a night out. After much searching and review reading, I finally went ahead and purchased the Anastasia brow duo in Warm Gold from Sephora. I LOVE this product because it's very natural looking and it comes with two shades so I usually mix both and fill in my eyebrows. The only downside is that it doesn't come with an angled brush but you can buy one from anywhere like Target or Sephora. Here's a good tutorial for the Naked 2 Palette I saw on Pinterest.